Our Family Car of the Year sets the benchmark for interior quality, but is it still the best all-rounder? Diesel is evil. It fills our lungs with deadly poisons and should be banned immediately. That’s probably what you’ve read if you’ve opened any tabloid newspaper in the past year or so. It is, of course, an overreaction. But the truth is that sales of diesel-engined cars have dipped in the wake of the notorious Volkswagen emissions scandal, and there are very rational reasons for choosing a petrol engine in your next car – especially if you’re in the market for a family hatchback. The three we’ve lined up here are particularly compelling. All have turbocharged 1.0-litre engines that deliver reasonable performance, and with the promise of more than 55mpg, you won’t even miss your old diesel’s fuel economy. 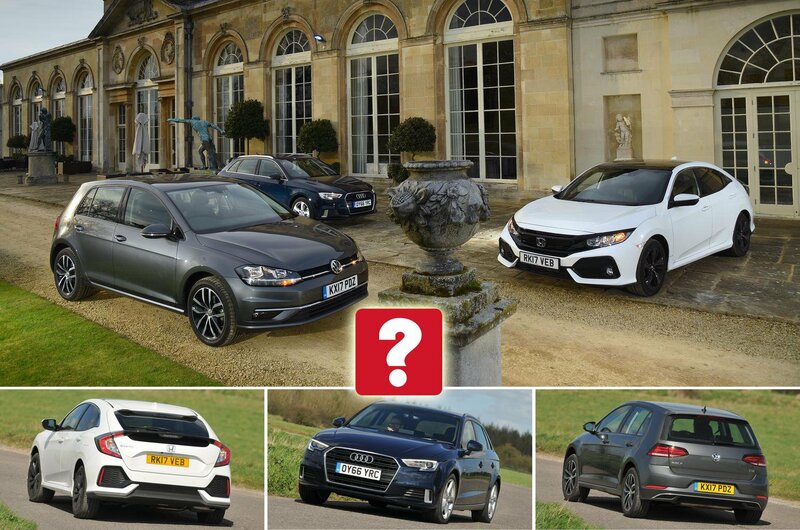 But which is best: the all-new Honda Civic, the just-revised Volkswagen Golf or our current Family Car of the Year, the outstanding Audi A3 Sportback? With the most power and the shortest gearing of this trio, you might expect the new Civic to romp away from its rivals when you put your foot down. Surprisingly, though, it’s actually the slowcoach in this comparison. Accelerate from low revs in third, fourth or fifth gear and it slowly but surely loses ground to the lighter A3 and Golf, both of which are closely matched for performance. Even when you rev the Civic hard, it still gets left behind, and its engine always sounds a bit more gravelly than those of its German rivals. All of our contenders have slick six-speed manual gearboxes and positive clutch pedals, making them easy to drive smoothly in stop-start traffic. However, you have to be a bit careful not to stall the A3 and Golf when pulling away quickly; it’s easy to do if you let the revs drop too low. Then again, the Civic’s brake pedal is a bit spongier than we’d like. 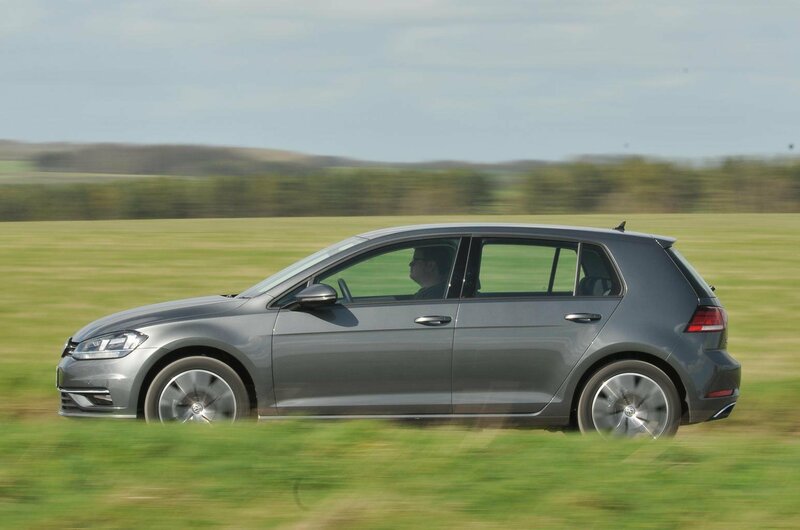 ‘Predictable’, ‘composed’ and ‘competent’ are all words that neatly sum up the way the Golf handles, because VW’s cash cow grips well, steers precisely and is generally excellent to drive. Most of the above also applies to the Civic. However, tackle a corner with any vigour and you’ll wish its steering weighted up more consistently to help you gauge how well the front tyres are gripping. 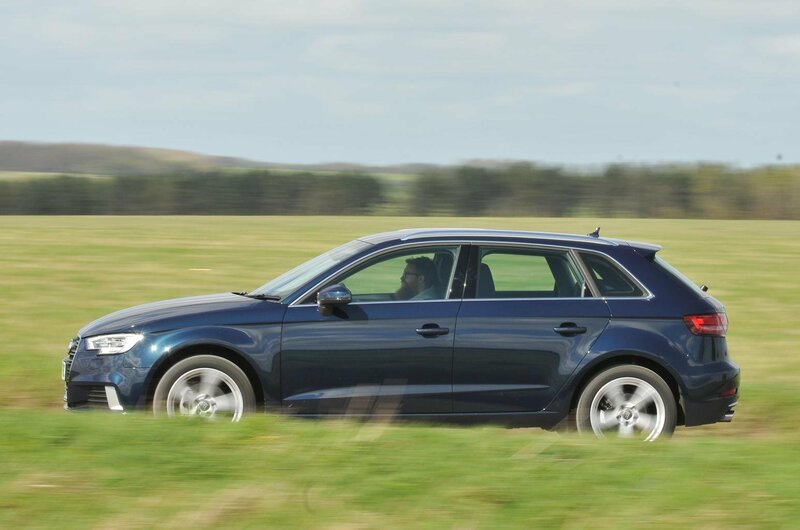 Meanwhile, the A3 is the most agile of our trio, responding quickest to steering inputs, gripping the hardest and staying the most upright through tight corners. For all those reasons, it’s the most fun to drive along a twisting country road, but the price you pay for that nimbleness is a slightly firm ride – particularly at low speeds. The Civic is fractionally more supple than the A3 around town (it’s important to note that our test car was a high-spec EX model with adaptive suspension, which isn’t available on SR trim), although it’s a little more unsettled on fast A-roads and motorways. However, it’s the Golf that glides over lumps and bumps in the most composed fashion. Few cars in any price bracket ride as comfortably. The Golf has the quietest road manners, too – mainly because you barely hear a peep from its tyres as they spin against the surface of the road. 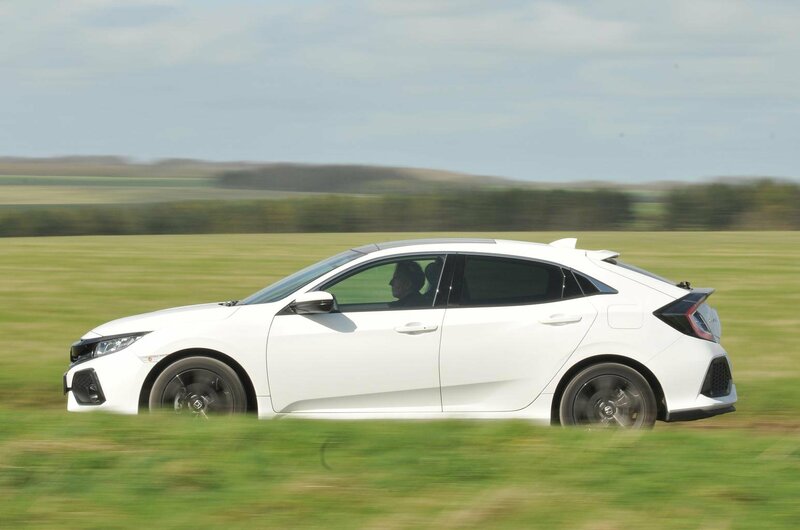 This is more of an issue in the Civic and A3, although the latter is the best of our trio at shutting out wind flutter, so it was noticeably quieter than its Japanese rival at a steady 70mph in our noise tests.